My name is Rylee Carlon. I am 16 years old and a Junior Handler. Growing up, dogs have always been a part of my life. 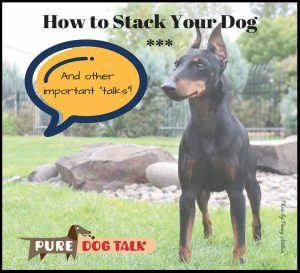 I loved learning about all the different breeds, AKC groups and each breed’s purpose. At 12, I became interested in the exciting sport of agility and knew this was a path I wanted to explore. I did extensive research on what breed would be my perfect dog and decided my heart was set on an Australian Shepherd. I worked very hard and saved up my money for my first Aussie puppy. My mom found a training center not too far away from us, where I was enrolled with my puppy in a S.T.A.R. Puppy class and passed the Canine Good Citizen (CGC) test. The trainer of the class noticed my drive, dedication and love for training. She introduced me to our local dog 4-H club, where I learned about showmanship, obedience, agility, and rally. I qualified for our State Fair my first year, where I received Award of Merits, Grand Champions and Reserves. After being successful in 4-H showmanship, I wanted to try my handling skills in the American Kennel Club (AKC) conformation ring. My only problem was my current Aussie did not meet the breed standard. So I worked equally as hard as before to save up money for my next Australian Shepherd. I was put in contact with a breeder in Idaho where I met Leo, a beautiful 10-month-old black tri Australian Shepherd. Leo and I received two Winners Dogs – a five-point major in Puyallup, Wash. and another in Coeur d’Alene, Idaho. Sadly, I lost Leo to Idiopathic Epilepsy before the age of two. After that horrific and heartbreaking experience, I didn’t know if I wanted to ever show again, but fate always seems to find its way! I decided that showing dogs was my passion and I would regret it if I quit. Finding my next show dog proved to be a challenge. 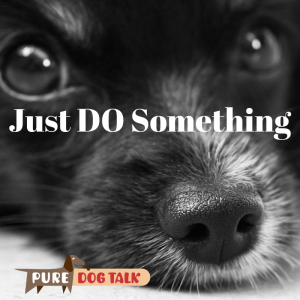 After many months of searching and reaching out to just about every possible Aussie breeder between the West and East coast via email, explaining my story, my mom stumbled across a PureDogTalk post on Facebook discussing the need to get Juniors more involved in the sport of showing. 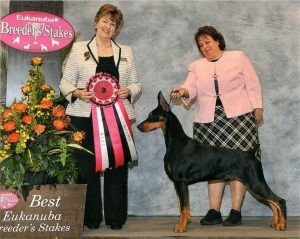 My mom left a comment saying, “I have a daughter willing and ready to show and she has the financial support of her parents, but finding a breeder who would place a nice show prospect with us is not an easy task.” Soon after, a lovely lady named Laura Reeves replied to her comment, saying if I wanted to change breeds she would have a puppy for me but if not, she would reach out to some Aussie people in the Pacific Northwest and try to make a connection to breeders. After several back and forth communications, I was put in contact with a Professional Handler who thought she knew the perfect dog for me in Canada. We had a phone interview with the handler to discuss my short- and long-term goals, and then I was put in touch with the breeder. A few weeks later, my mom and I made the trip to Canada to meet Channing, another beautiful black tri Aussie who was 2 years old and his breeder, Kim Schmidt. Rylee Carlon and Channing earning his AKC Championship. Channing and I have had a very successful show career which consists of me recently getting his AKC Champion on him, Best Juniors and Reserve Best Juniors in AKC and ASCA. As of today, Channing and I are still showing in the breed ring as a special and rocking it in Juniors. I have plans to attend my first ASCA National this year in Greeley, Colo. We will be meeting Channing’s breeder there for a reunion.